It seemed like the odds were against Finance Professors Richard Bauer, Ph.D., and Adrian Cowan, Ph.D. In the fall of 2007, when the University approved a $1-million student-managed investment portfolio, the economy was facing the worst financial crisis since the Great Depression, and Wall Street was taking a beating. But seven years later, the portfolio is in great shape, having reached $1.6 million and growing. “We have been riding a nice wave, and the students have made good decisions,” Bauer said. Bauer and Cowan trade off teaching the investment courses. Bauer, who supervised the project in spring 2014, teaches finance courses that allow undergraduate and MBA students to invest the portfolio, develop trade recommendations, and analyze financial information using 12 Bloomberg terminals. 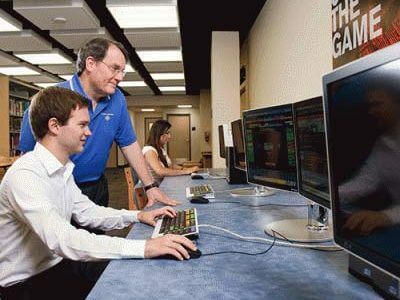 The terminals serve as computer systems that allow the students to analyze and monitor real-time financial market data and place trades on an electronic trading platform. Every undergraduate finance major and MBA student will be involved in the portfolio at some point before graduation. Within the past year, the project has seen major changes, including development of new investment strategies for analyzing stocks, broader student involvement, and the transition from a group decision-making approach to an individual one. Bauer estimated that St. Mary’s is in the top 50 schools nationwide in terms of the amount of money invested in the portfolio.